Pigtail macaques are found in the rainforests and lowlands throughout much of Southeast Asia, from northern India and southern China to Thailand, Vietnam, and south to Malaysia and Borneo. With their brownish fur and solidly built bodies, these Old World monkeys are easily identified by their short and curled tails, which they carry half-erect over their backs. In the wild, where their average lifespan is about 25 years, pigtail macaques may grow to a foot and a half or more and weigh as much as 30 pounds. Like other primates, their survival is being threatened by habitat destruction, as timber harvesting escalates along with the conversion of land for farming. And they face other threats, as well: in some countries, for example, they’re widely killed for food, while elsewhere they’re captured for everything from psychological studies to laboratory trials involving HIV/AIDS research. 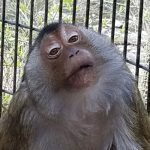 Maddie arrived here from Michigan after her owners realized that their young pet needed the company of other monkeys to be truly happy.